Place cubed chicken in bottom of the slow cooker. Whisk together next five ingredients (soy sauce, sugar, rice vinegar, garlic and ginger paste). Pour over chicken and stir to combine. Using a slotted spoon, remove chicken. Turn slow cooker to high. In another dish (or coffee mug) mix cornstarch with water until smooth with no lumps. Pour the cornstarch slurry into sauce, stirring to combine. Add the chicken back to the sauce and allow to come back to bubble, which thickens the sauce and coats the chicken. 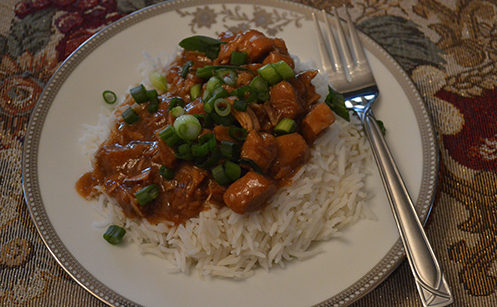 Serve over white rice and dress with scallions.